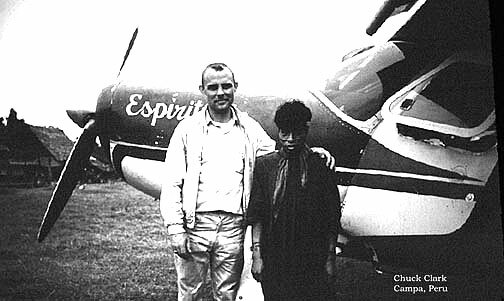 Picture of photographer Chuck Clark with Campa Indian in the Peruvian Amazon during the 1960s posing in front of the aircraft appropriately named "Espiritu" (Spirit). Although he was not a missionary, Clark volunteered as a photographer for SIL (Summer Institute of Linguistics) and was flown into many remote Amazonian villages to document their traditional cultures. This turned out to be quite the challenge in that indigenous Amazonians are often notoriously camera-shy, never having been previously exposed to cameras or photographic images. Clark solved this problem by improvising a "fake camera lens" and hiding the real camera lens inside a lens hood so that it appeared that he was photographing in the other direction with the fake lens, when in reality he was capturing images of the natives themselves, unbeknownst to them.